ab99811 reacts with lambda light chains as demonstrated by ELISA. Our Abpromise guarantee covers the use of ab99811 in the following tested applications. ab99811 has not yet been referenced specifically in any publications. Publishing research using ab99811? Please let us know so that we can cite the reference in this datasheet. 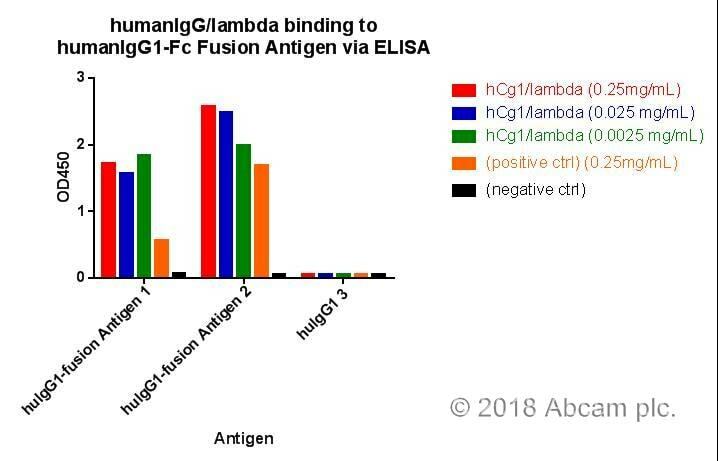 This reagent is indispensable when detecting binding of a humanIgG1/lambda antibody to antigen that is fused to humanIgG1 in a direct ELISA. Coating antigen at 10ug/ml, antibody at 1ug/ml, and diluting this reagent 1:1000 gave sufficient signal for detection with low background.